Larry Schaffer, owner/winemaker at Tercero Wines was in rare form and so were his wines. 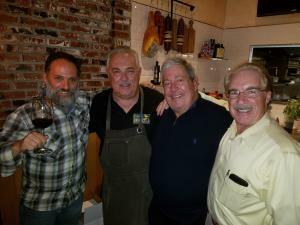 The cuisine of Claudio Marchesan showed that great Italian cuisine can work not only with Italian wines but food-friendly California wines as well. This little osteria hides in plain sight on lower Montana Ave. 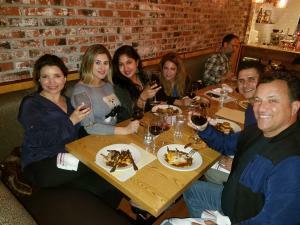 Most attendees were new to Osteria Bigoli and most have found their new favorite Italian restaurant. Most popular wine of the evening was a toss up between the 2014 Tercero Viognier and the well-aged 2013 Tercero Mouvedre. Both wines showed well with their food courses and could be expected to last many more years with proper cellaring. Executive Chef Claudio Marchesan and his culinary team did a great job creating ideal pairings and allowed the wines to complement each course. We hope you’ll join us for our next wine dinner. Fill in your name and email below and we’ll keep you informed. 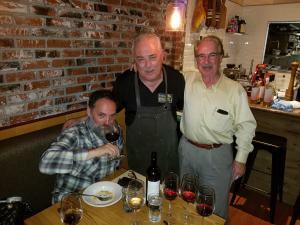 Restaurant critic Anthony Dias Blue was one of the happy guests at Bigoli dinner. Bigoli guests enjoying great wine, food and conversation during the dinner. The best wines are the ones we drink with friends. Join us!